I can’t speak for others who venture into the outdoors, but I always seem to have enough to occupy myself for today. Tomorrow is the unknown today, and I’ll worry about that then. 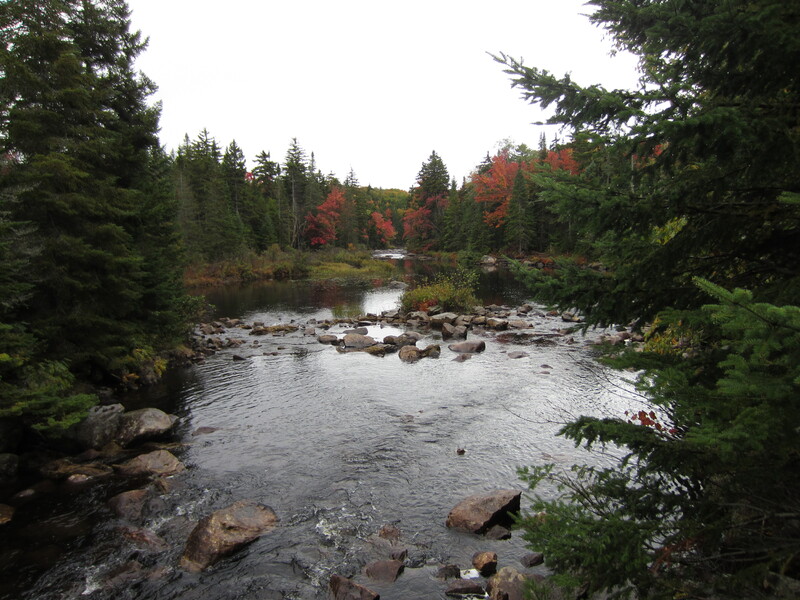 That could have been the theme for my solo hike into the West Canada Lakes Wilderness in New York’s west-central Adirondacks this past September 22-24, 2012. 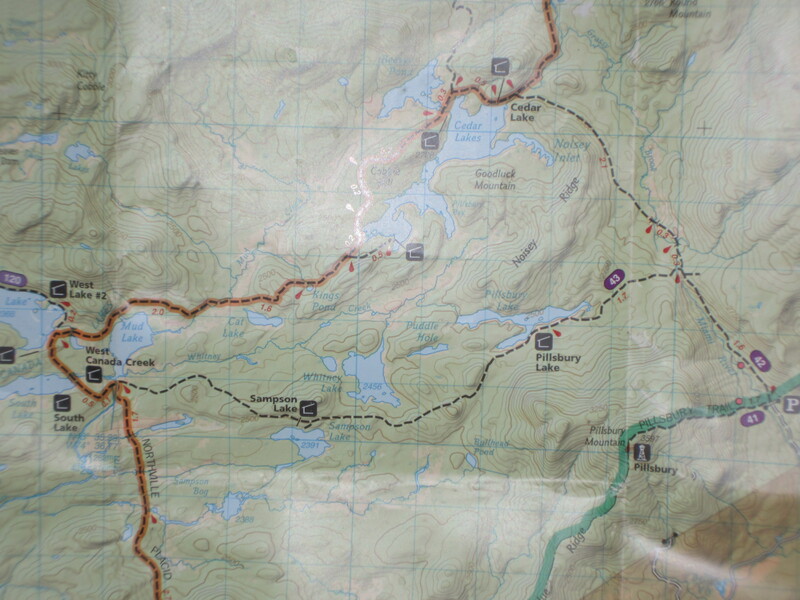 I threw on my pack, and around 5 pm I started the 5 1/2 mile slog to Cedar Lake lean-to #2. 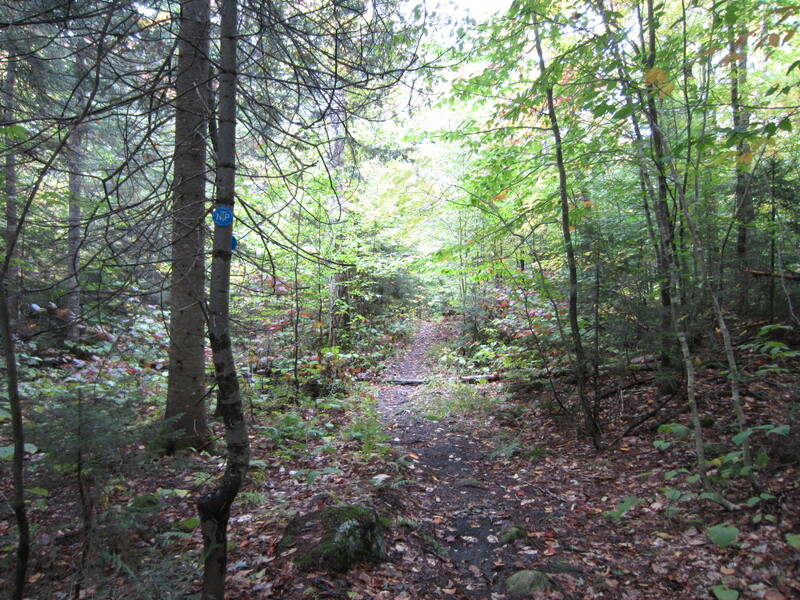 The miles flew by as the hike alternated between thick green forest and boggy swamp on surprisingly dry trail. 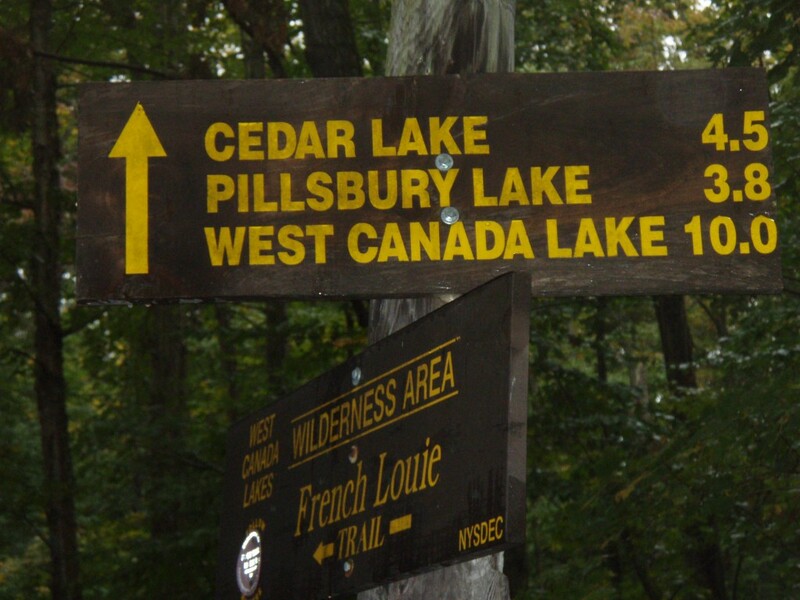 The trail gave no clue as to anything that resembled lake country; I was completely surprised when the woods finally gave way to Cedar Lake. I reached the #2 lean-to right at dark, two hours after starting out. It was occupied by a father and son who, after 300 miles of driving and 5 1/2 miles of trail, lived about 5 miles from my home. Small world. Their company, as well as the warming fire they had going made for a good finish to a long day. I decided not to try to pitch my hammock in the rainy darkness, and opted instead to use the lean-to. Truth be told, my feet hurt and I was tired, so I hit the sack without dinner hoping for a better tomorrow. I slept in and awoke with no soreness in my feet, although my knee was a little tender (I tore the miniscus in my left knee a couple of years ago and still haven’t gotten it fixed). My shelter mates were up and out at a decent hour, but I decided to take it easy. I was still in my bag eating breakfast when they left and this turned out to be the perfect opportunity to start my morning in the book of John, chapter 7 (it’s my habit to read where my home church will be teaching on Sunday morning). Between the view and the word, there couldn’t be a better start to the morning. What better way to start the day than with a great view! The rain had stopped, with the sun occasionally trying to make an appearance and the day was full of promise. 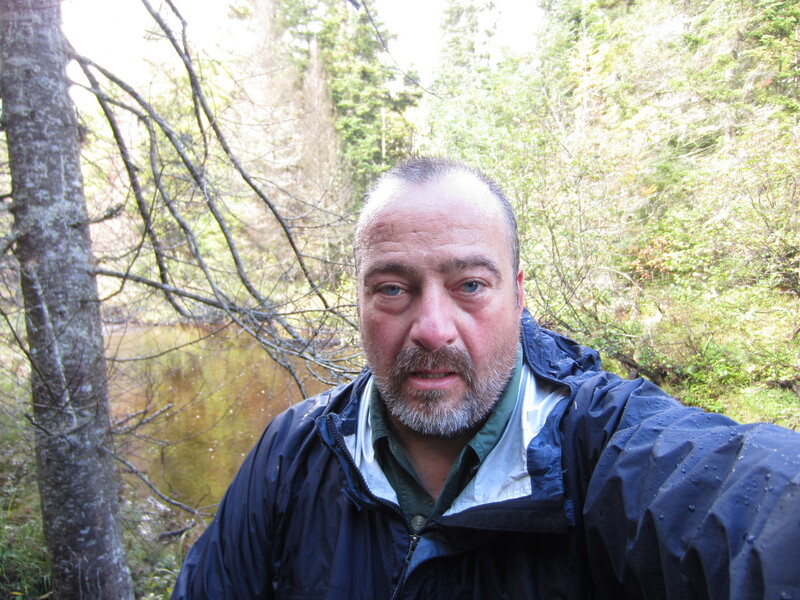 Earlier I had thought about whether it was wise to continue further into the wilderness with a sore knee, and I had considered doubling back and camping closer to my truck, but in the end I decided I was up to the task. I prayed for God to keep me safe and strong, and off I went. As I crossed Cobble Hill it started to rain once again and at first I didn’t bother with my rain gear. The trail was really nice and free of blow downs. As I passed Cat Lake something changed and at first I couldn’t place it. Then it suddenly dawned on me – it was hailing! On with the rain jacket as the weather started to get progressively worse. Feets don’t fail me now! I stopped at Mud Creek to grab a bite and thankfully the hail stopped. Normally I enjoy whatever the weather throws at me, but today I was in no mood. I was looking to be immersed in God’s creation, not submersed! Just when I was hitting bottom God reminded me just how lucky I am. After passing the junction to West Lake I came to the South Lake bridge. Just as I stepped onto the bridge a family of river otters swam by and turned to get a closer look at me. Awesome! I stood on the bridge and took it all in – the views, the weather, the wildlife. At that moment I felt grateful for God’s provision. This was but a small taste of how it must have been when God looked down on his creation and said it was good. 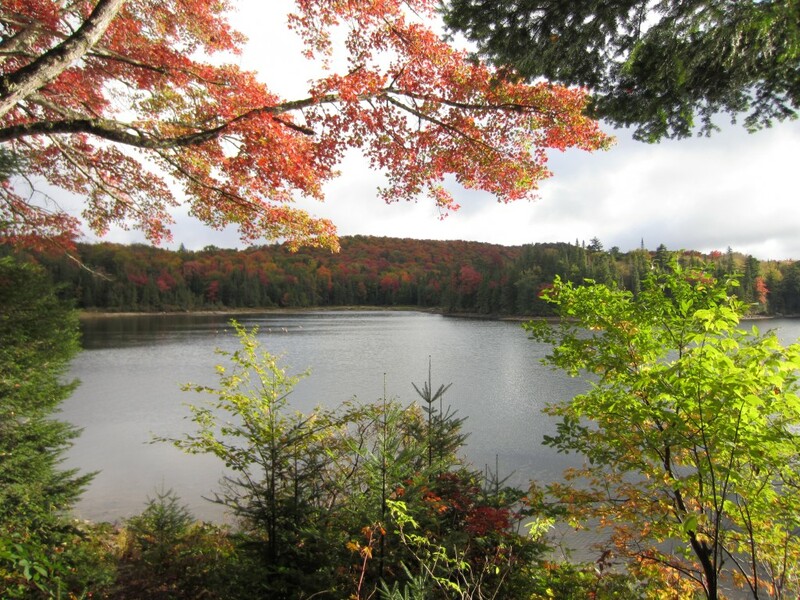 I have to say, I really enjoy hiking in the Adirondacks. 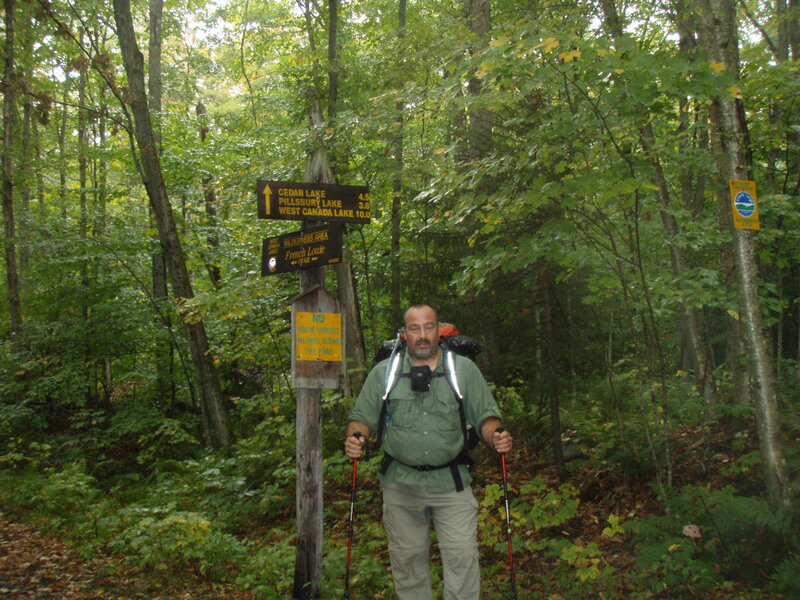 I spent the first twenty five years of my hiking experience as an Appalachian Trail section hiker. When I started hiking in this region I realized I was home. Had I known from the beginning, I don’t think I would have gone anywhere else. The remaining .7 miles flew by and I climbed a small hill to arrive at the West Canada Creek lean-to. I dropped my pack, grabbed my lunch and broke out the map. I was chilled and tired, but it was only 2 pm! On one hand the lean-to and privy were the nicest I had seen, sitting on a small rise overlooking West Canada Creek. 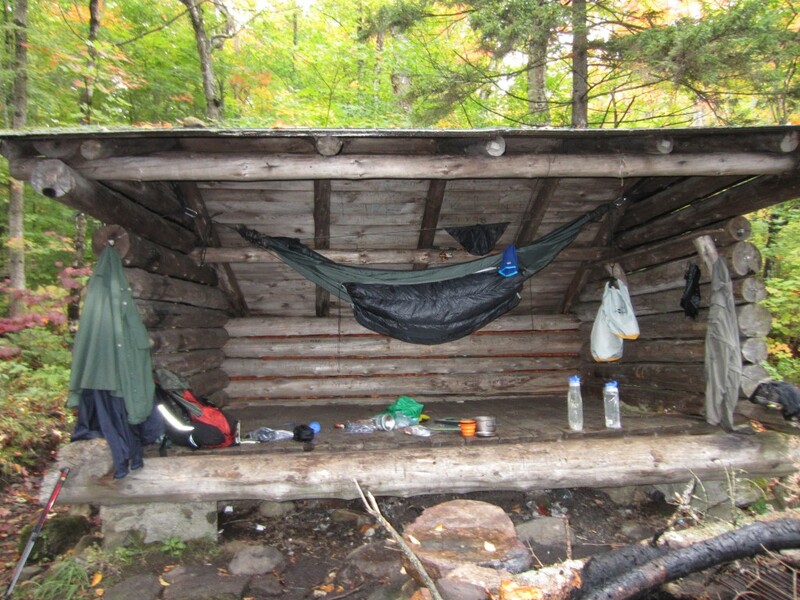 On the other, it wouldn’t take long for me to get antsy, as Sampson Lake lean-to was only another 2.5 miles. I opted for a shorter last day, and packed back up just as the first and only actual hiker I would see in three days crested the hill. He was a NPT (Northville-Placid Trail) thru hiker. We talked for a few minutes and then parted ways, he northbound and I leaving the NPT for the French Louie Trail. At the bottom of the hill I crossed West Canada Creek, watered up and took the turn-off that led toward Sampson Lake. At this point I wasn’t feeling like I was making great time. I really thought I was only going about one mile per hour. It was slightly rougher going as the trail here was a little more in line with what I picture a wilderness trail to be; lightly maintained, in places even vague. This section had the only real blow downs I can recall, and the going was basically steadily uphill. After what seemed like quite a while I sensed that there might be a lake in the forest ahead and below me. The woods tend to fool you at times and your mind plays tricks on you as you anticipate your days destination. Finally I came to what I had to believe was the trail junction to Sampson Lake lean-to. 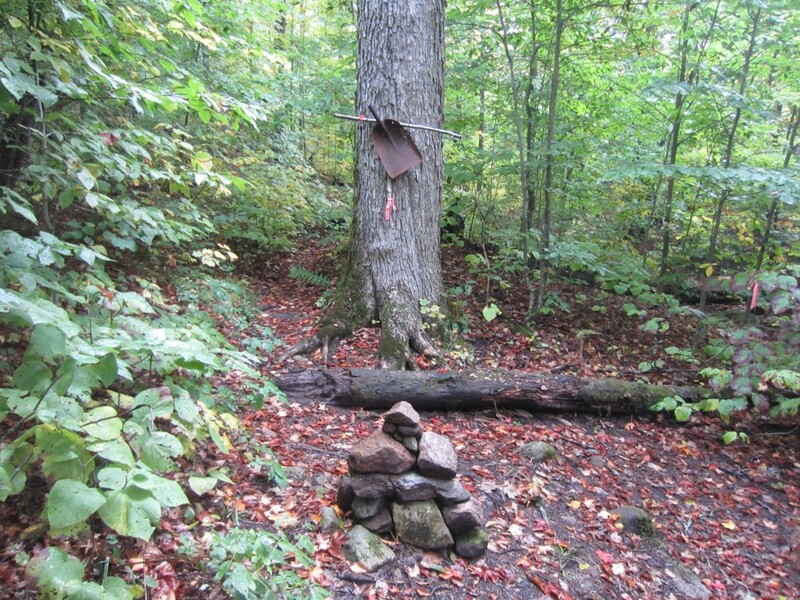 There was a rock cairn in the middle of the trail, a shovel blade nailed to a tree, and pink surveyors tape. I would have settled for a simple sign, but what do I know. 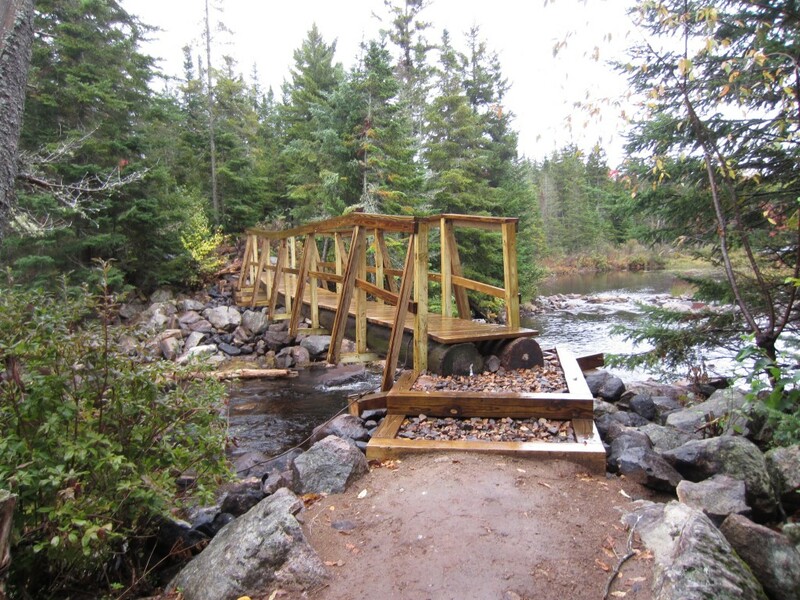 Truth be told, about half of the trails leading to lean-to’s in this wilderness area don’t have signs, so you have to remain aware of your location on the map if you plan on using them. Cedar Lakes #2, #3, South Lake and this lean-to left you guessing where they were, and most were easy to miss (I didn’t see the junction for Cedar #3) if you weren’t paying attention. I kinda like that. I reached Sampson Lake lean-to at 3:30 pm (not bad), and considered my surroundings. There was a point with a great view of the lake just beyond the shelter. There were plenty of trees to hang my hammock, but most looked like widow makers. In the end I decided that if no one else showed up I would hang in the lean-to. First order of business was something hot in my belly. As I waited for my water to boil I hung my Hennessy in the lean-to, as owls and loons called across the lake. I enjoyed their calls as I wolfed down mashed potatoes to which I had added canned chicken and gravy. Washed down with a hot cuppa tea, this was a meal fit for a king. After getting into warm dry clothes I did what little housekeeping needed to be done and settled in to read the word. Last thing I remember was plugging in my ipod and falling asleep just as the sun set, while listening to worship tunes. I awoke a few times during the night to the calling of both the owls and the loons, but otherwise slept well. No hurries, no worries. Day three dawned sunny and warmer and once again I took my good old time moving out. I only had 6.9 miles and all day to hike it. After I packed I spent time in Proverbs 24, “If you faint in the day of adversity, Your strength is small”, and reflected on the challenges of the past few days. Reluctantly I said good bye to Sampson Lake, and was on the move by about 9 am. The trail from here on out was clear of blow downs and was through some very nice forest. After passing Whitney Lake the trail became an old woods road, and before I knew I was at the turnoff to Pillsbury Lake lean-to. I stopped and ate lunch, but the cool breeze coming into the front of the lean-to made this stop a brief one. 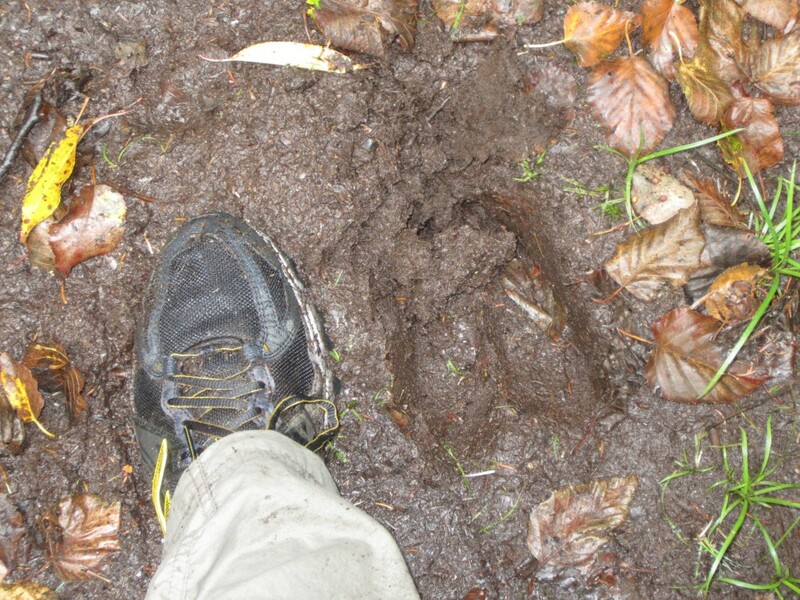 Back on the trail I passed a set of moose tracks. I see tracks all the time, but never any actual moose. Oh well, I guess I’ll have to keep doing this until I do, lol. All too soon I reached the turnoff back to the trail head. The next 1.8 miles were all downhill at this point and before I knew I was back at my truck. What a trip! Three days of walking, covering 22 miles and aside from my shelter mates the first night I only passed one other hiker. 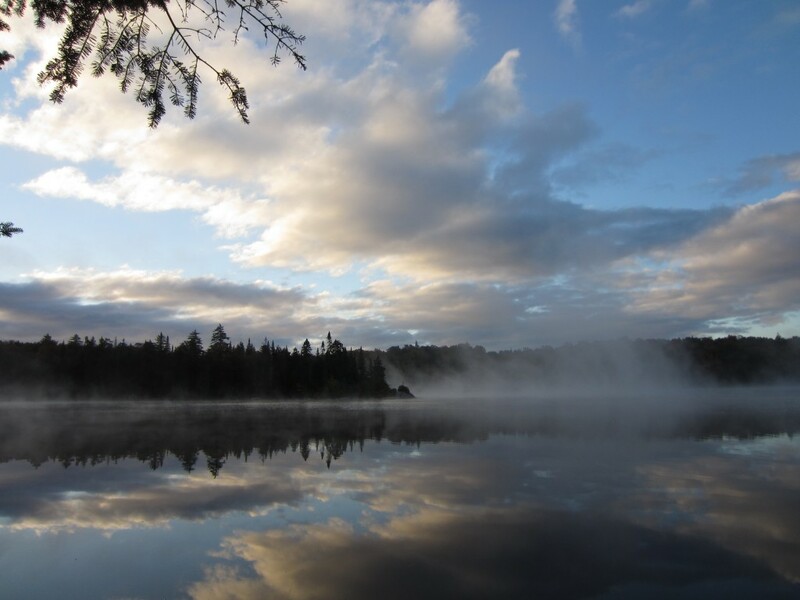 If solitude is what your after, the West Canada Lakes Wilderness just might be the answer. I’m sure I’ll be back to explore more of what this area has to offer. Plenty of parking on a Monday morning! 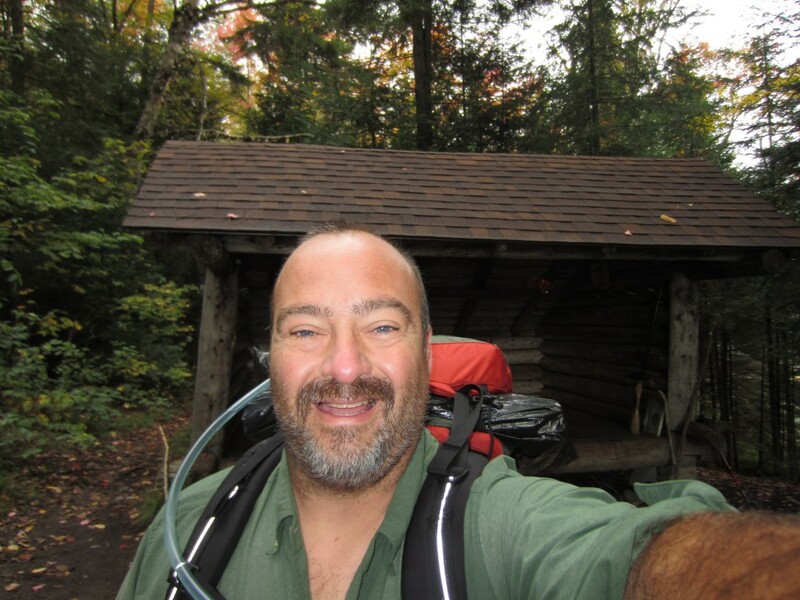 This entry was posted in Amblings and tagged adirondacks, matthew, west canada lakes wilderness by George. Bookmark the permalink. I liked your pics of the trip. Liked the moose tracks, and would’ve been cool to actually see him. What were the swimmers, beavers? 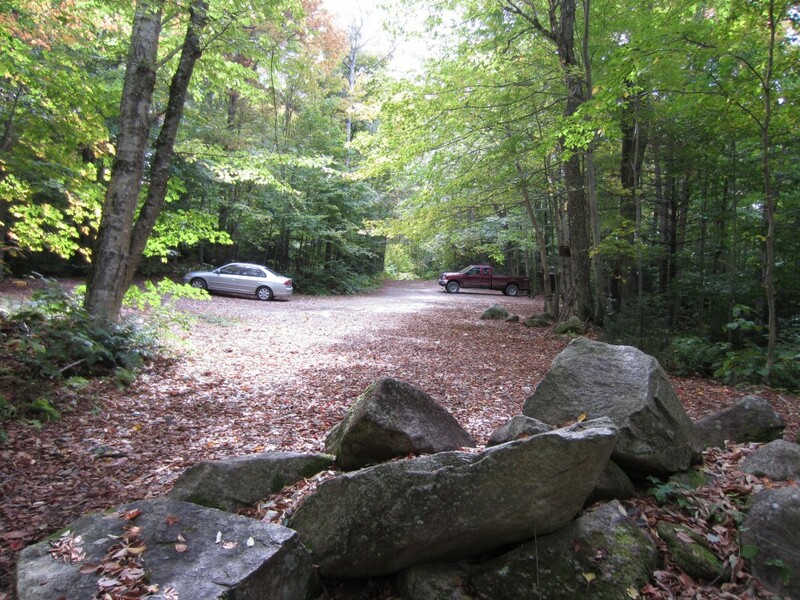 Hope to make the water gap hike. Thanks Mark! Hope you can make it too! They were otters. Great trip report and beautiful pictures. So happy that you finally got to “submerge” yourself in God’s creation. At the bottom of the page referring to Matthew 6:25-34 is this thought / prayer. “Lord, often I find myself thinking of other things when I pray. My thoughts drift to the house payment, the dinner menu or the amount of gas in the car when I should be reflecting on you and your greatness. Still, I know that the things of this world are insignificant when compared to the glory of your kingdom. Grant that I may keep a sense of humor, a forgiving spirit and a commitment to the coming kingdom as pillars of my life. If I have these things, I know you will be forever with me”. BTW Cheryl was Ooooooooooing and Ahhhhhhhhhhhhhing over the beautiful Fall colors. She was especially impressed by all of the reds, oranges and yellows in the River Otters video. I won’t be going solo but I hope to get out into the wilderness very soon with “Lazarus” a.k.a. David and my brother-in-law Joseph. David and I made it a point lately to plan our hiking so that we can attend church in the local area wherever we are at on the trail on Sunday. Sometimes it even involves a shuttle to a different trail town. I really like your idea as kind of a compromise between not actually being in a church but “being the church”. The Church is the people of God, the Body of Christ, the Temple of the Holy Spirit. George, thanks for sharing your experience and photos. Makes me want to get out and walk. Looking forward to our next hike together. The real camping season is finally here!!! Counting the days for The Water Gap. Looking forward to it, Dean!